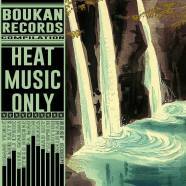 Home » Interviews » Record Of The Day – Boukan Records Volume 1. Record Of The Day – Boukan Records Volume 1. Percussive, Rhythmic, Warm, Eclectic, coherent. A diverse range of tracks, that stay consistent despite their different registers. We kept the same artists who are mainstays on the Boukan label and invited a few guests with whom we like to work. There was not really theme, but i think we are all at the same level of rhythm. Whether Afro or break beat, percussion still occupies a large place in the track. I do not know if it would be a club, but rather festival near the coast, beach atmosphere or ideally near a freshwater shore.